Your destination is La Paz, Baja California Sur. Currently You can fly to La Paz from Mexico City or Guadalajara on daily flights with the following airlines: Aeromexico, Volaris and Interjet. Alternatively, you may prefer to fly to Los Cabos and shuttle up to La Paz. Note that Cabo is also referred to as Los Cabos, Cabo San Lucas, and San Jose del Cabo. To avoid confusion look for the airport code: SJD. Los Cabos is one of Mexico´s premiere resorts so there are numerous airlines offering low cost flights from many different US and Canadian cities. Airlines include: AeroMexico, Alaska, American, Continental, Delta, Frontier, Virgin America, West Jet, Spirit, United, US Air and Virgin America. There is an efficient shuttle service offered by this company: www.ecobajatours.com It takes 3 hours to reach La Paz. From there, it is only a 5-minute cab ride to most hotels. Alternatively you can rent a car and leave it with us while you are out on your trip. Also for groups of 6+ it is worth considering a private taxi that can be booked through us. Fall: This is our favorite time in Baja. October thru November the weather is usually perfect - hot in the day but cooling down in the evening for a good night´s rest. This is also the best time of year for snorkeling- warm water and excellent visibility. Winter: December - February is often windy and offers some exciting / challenging sea-conditions. Great for intermediate paddlers that want to increase their paddling skills. February is also the whale-watching season for viewing the Gray whales in their natural breeding grounds. Spring: March to May the temperatures get progressively warmer but cool evenings make camping ideal. Also the later in the spring the less you see other kayak groups - note: Spring Break is the busiest time of year so book early. Baja is well known for gorgeous aquamarine tranquil seas with stunning beaches for camping and world famous marine-life. In fact during the winter months, it is one of the most popular sea-kayaking destinations throughout the northern hemisphere. However "northerlies" are particularly present between late November and early March and can sometimes blow for three days at a time, though more commonly they are limited to being strong afternoon breezes. Espiritu Santo's deep fjord-like bays provide relatively safe protection from these prevailing winds but there may be day(s) when it is simply too windy for us to go kayaking. It may still be possible to practice kayak skills - rescues, the Eskimo roll even surfing but not possible to advance from one bay to another. Your guides are highly experienced and they will always offer alternative activities if it is not considered safe to kayak-ie. Hiking, snorkeling in a protected bay etc. Below is a guide to the temperatures that are typical for the time of year. However the global "climate change" occasionally creates unexpected weather. You are welcome to contact us to check on the forecast the week before your trip. Fully Catered Trips: These trips have a more relaxed feel as a motor boat (panga) escorts the group and transports all our gear from one camp to the next. This means that your kayak is light and of course, there is no need to pack and unpack it each day. Cooperatively Catered Trips: The main feature of this type of trip is that there is no motor boat support. Therefore, you are kayaking fully loaded kayaks and participating in all the camping and cooking duties, under the leadership of your guides. If you are on a Cooperative Catered Trip: All the expedition gear is packed into our kayak hatches so your personal belongings should not exceed the capacity of one medium dry bag (9"dia x 30" approx). Your tent, sleeping bag, Therma rest and snorkel gear can be packed separately. These items can all be loaded directly into your kayak in their respective bags. If your sleeping bag is in a stuff bag it's a good idea to line it with a trash bag. If you are on a Fully Catered Trip: All your gear will be carried in the motor boat so you should pack everything into one or two duffel bags. You DO NOT NEED to pack your personal gear in a dry bag. If you are planning a family reunion and would like to arrange a private trip, please refer to our private groups page. However, if you are a single family aiming to join other families travelling with us, please let us know which trip you are interested in and 'approximate' dates and we will endeavour to match you with another family or two. Coordinating family trips helps create opportunities for children to make new friends. Also, the natural pace of having families on the same trip can create wonderful dynamics for the entire family. BOA takes a combination of singles and double kayaks on all of our trips. We try to rotate people around so that every one has a chance to paddle the different kayaks. We ask you on the booking form whether you have a strong preference between a single and a double kayak so that we can take it into account when preparing for your trip. Most of our expeditions are over in the magnificent national park island of Espiritu Santo. 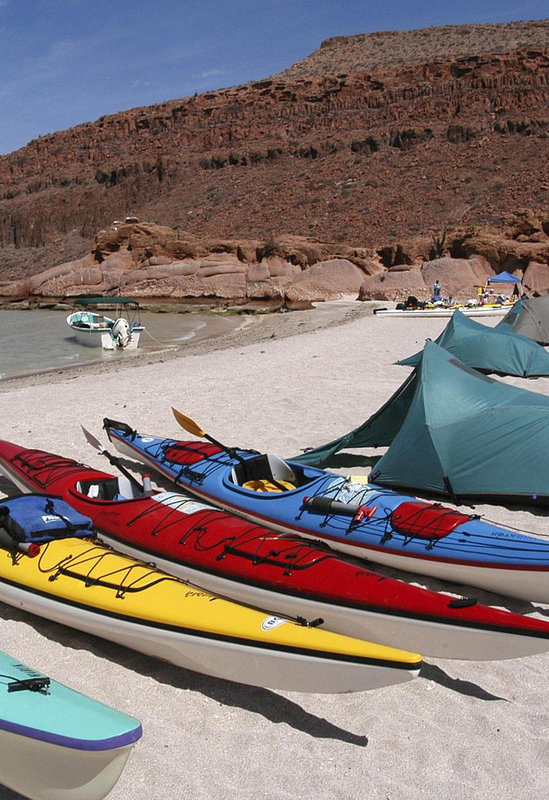 This paddler's paradise is conveniently located only a 40 minute boat ride away from La Paz. During our kayaking trips there is often time and opportunity to fish. It is of course more practical on our fully catered trips in which we have the panga to transport our gear. If you are keen to participate/fish, please come prepared with your own rod and lures. The telescopic type of rod is ideal for travelling and to transport on our trips. Green and yellow medium size (4-5") Rapalas http://rapalaworld.com/ are the most popular lures. We also have a limited number of rods available on our fully catered trips. At times you may be able to fish from your kayak and/or from the rocky shoreline. Also on the skiff supported trips there is usually an opportunity to fish with our crew. You will need a fishing permit which can be purchased on-line. Alternatively you can buy one in our office before the trip. We provide marine portable toilets which are set up in secluded locations each time we change camp site. Basic washing facilities are provided along with a solar shower on our fully catered trips. Your guides will give an overview to their operation. Many of our guests ask about tipping the guides on their trip. It is customary within the industry and a fair guideline is around 5-10% of the trip fee. Please allow your satisfaction with our service to be the best judge of how much you would like to tip. Gratuities are shared evenly amongst the entire crew. We kindly request cash only as checks and credit cards create complications and taxes. We require a 50% deposit to reserve a place on any of our trips. Full payment is then due 60 days prior to the departure date. 100% refund with 2 months notice prior to the trip. (Less $100US per person admin fees). 50% refund with 1 month written notice prior to the trip. NO refund is given with less than one month´s written notice prior to the trip. Separate terms apply to private group trips. In the highly unlikely event that BOA has to cancel a trip, due to lack of participants or some other uncontrollable factor, we will give at least 1 month's notice prior to the departure date. A full refund is given. BOA is not responsible for expenses incurred by trip members in preparation for the trip (e.g., non-refundable airline tickets, personal gear bought for the trip etc.). If your trip includes hotel accommodation and you are a solo traveler that wishes to have your own hotel room (or if we are unable to pair you up with another solo traveler) there will be an extra fee of $40us for each hotel night that is included in your trip itinerary. ie. the Espiritu Santo Circumnavigation trip includes 2 hotel nights so as a solo traveler having your own hotel room you will be charged an additional fee of $80US.